Sylvester's story is one to tell, born in a parking lot to a litter of four on one of the coldest days in April 2004. While his mother did her best to care for them, only two of them were still alive just five days later. Not baring the thought of them freezing to death, I took both kittens home. There I cared for them, bottle fed them and made sure they were comfy and safe. I eventually found a home for one whom we called Oreo she was a sweetie pie, but for some reason the big boy whom we named Sylvester we couldn't part with. He quickly took ownership of my heart, and has been my spoiled baby boy since. In 2007 when he was only four years old he gave us quite the scare, we came home and he was lying on the floor listless and with no movement, he seemed to be in great deal of pain. We rushed him to the hospital and sure enough he was diagnosed with bladder stones, and needed surgery immediately, complications went on for days, eventually had to be transferred to a specialist in New Rochelle, where Dr. Surgeon saved our little guys life. Sylvester ended up needing a Perineal Urethrostomy, never having heard of this I was baffled. But now, years later our boy is healthy, no complications and still that big ton of fun. Now weighing 20lbs, he is larger than life and I couldn't love him more if I tried! Everyone in our world knows what he means to me, and always ask how the gigantic cat is..lol I can't remember what life was like without him, he is the first one to greet me in the morning, at the door when we get home and the last one by my side when it's time for bed. Sylvester is an exceptional Cat, and has lived up to his his name, playful, hysterical, king of his domain and likes to be heard. I love him to pieces and couldn't imagine a better match. Hello, Sylvester in New York! Happy Cat of the Day! What a handsome fellow you are! You look very nice in your tuxedo, with your sweet face, your cute pink nose and paw pads! Your fur looks so velvety soft, I would love to pet you! Since I can't, though- I hope your people will give you loads of petting and hugs for me. You had a health scare as a young cat, developing bladder stones and needing a urethrostomy. That must have been a scary time for your people! You have recovered and are doing well - three cheers for your health! I can tell you are a much loved kitty! You took ownership of your person's heart from the first days you and your sister were tiny kittens, rescued from the cold. Your person loves you to pieces, couldn't imagine a better match and couldn't love you more! Friends and neighbors always ask about the gigantic cat! You are a busy kitty, too ... being the first one to greet your person as soon as the door opens, being playful and joyful. You have much to say and like to be heard! I'd be glad to sit and listen to whatever is on your mind! Best of all, your person can't remember what life was like without you! PURR-fect! Happy, happy Cat of the day to sweet, handsome, wonderful Sylvester! Dearest Sylvester, what a gorgeous guy you are! You are a fine-looking kitty with that beautiful thick Tuxedo fur that looks so very soft and that sweet face with the long, LOOONG white whiskers and the cute pink nose and those lovely big eyes. Thank you for sharing those great photos with us! You are so pretty in all those different poses and moods. Are you really drinking through a straw in that last picture? In that one of you lying on your back, are you looking for a tummy rub? I wish I could reach through the screen and over to Yonkers to rub it (only if you want it rubbed, of course) and pet you. I can't, of course, but I know your loving and beloved Purrrson will rub that tummy (only if you want it rubbed, of course) and pet you for me . And what a story you have to tell! You and your three littermates were born in a parking lot on a cold April day in 2004. After five days only you and another of them were still alive. Your dear Purrrson-to-be took you both home to keep you from freezing to death. (We're very sorry your other littermates didn't make it, and we hope your kitty-mom survived.) He/she took good care of you, bottle-feeding you and keeping you comfy and safe. Your dear Purrrson found a good home for your littermate Oreo but she/he could not part with you! You stayed and took ownership of his/her heart, and there you have been all these 14 years later! In 2007 you had a serious medical scare, but with excellent treatment and care you survived. Youve been healthy ever since, with no complications, and you're still that big 20-pound bundle of fun! You greet your dear Purrrson first thing in the morning and at the door after work, and then you're side-by-side at bedtime. You and she/he love each other very much, don't you. He/she loves you to pieces, cannot remember what life was like before you came, and can't imagine a better match. What a wonderful love-filled home you share! 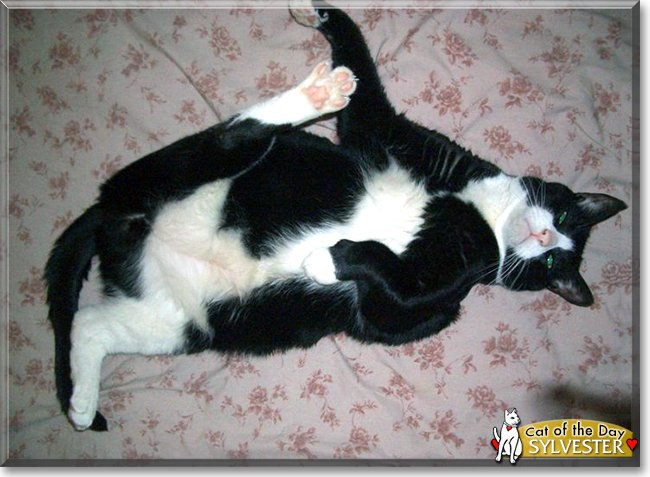 Congratulations, darling Sylvester, on being chosen today's Cat of the Day! We hope you and your dear Purrrson and all your family and friends are enjoying a fine celebration, full of fun and lovies and all your favorite games and treats. Dear Sylvester, what a most handsome tuxedo boy you are. You look so soft and shiny, and you have the longest whiskers which make your face even sweeter. I am so glad that you were rescued from that parking lot when you were a tiny baby. You have grown into a "gigantic" cat, full of love, life and mischief. Along the way, you gave your parents quite a scare. You almost lost your life when you were unable to urinate. Thanks to a specialty surgery, you pulled through. You are doing great, and your family couldn't imagine life without you. Sylvester, you are a special and precious kitty, and I wish you and your family a great day full of celebration, and many more happy and healthy years together. What a handsome Tuxedo kitty you are, Sylvester. I am so glad you and Oreo were rescued from that Parking Lot. You had bladder stones but after treatment you recovered! Hi Sylvester! Congrats on being crowned our very special and most deserving Cat of the Day! Hope you were treated to a very special day of celebration, being loved and pampered to pieces! What a handsome, oh so spiffy Tuxie boy you are, Sylvester! I'm so sorry to have missed your big day, computer issues! But had to come back today to tell you how much I enjoyed reading your heartwarming backstory, your life affirming rags to riches homecoming tale! Endless thanks to your mommy for coming to your and your siblings rescue, for her devotion, doing all to assurrome your and Oreo's survival; assuring that like you, Oreo would too find his way to a loving forever home! I'm so happy to hear you're doing so well after you very serious health challenge, those horrible bladder stone, bouncing back from your surgery like the champ that you are! How blessed your mommy was, the day she opened her home and heart to one most deserving boy! How lucky she is, having a beautiful, loyal and loving best friend, a never ending source of joy, love and laughter, a full fledged furry family member in you! You truly are one EXTRA special boy, Sylvester, one in a million, simply the best! Thanks for the BIG smiles, sweetheart! Meeting you, reading your heartwarming rescue story and seeing all of your heart-melting photos, has been a real treat! Lots of love, hugs and smooches to you, precious Sylvester, our very special and most deserving Cat of the Day, EVERY day!